The American Girl Doll Two-Piece Swim Suit features a bikini top and skirt bottom. The bikini top has a halter-style neck. 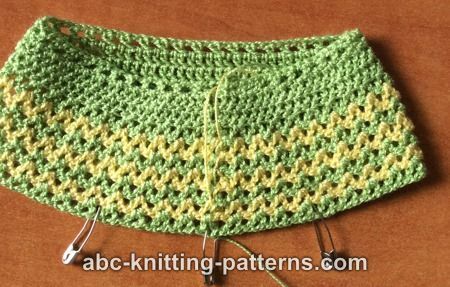 It is composed of two triangular motifs which are crocheted separately, then joined together. The skirt bottom is crocheted seamlessly from the top down in rounds. 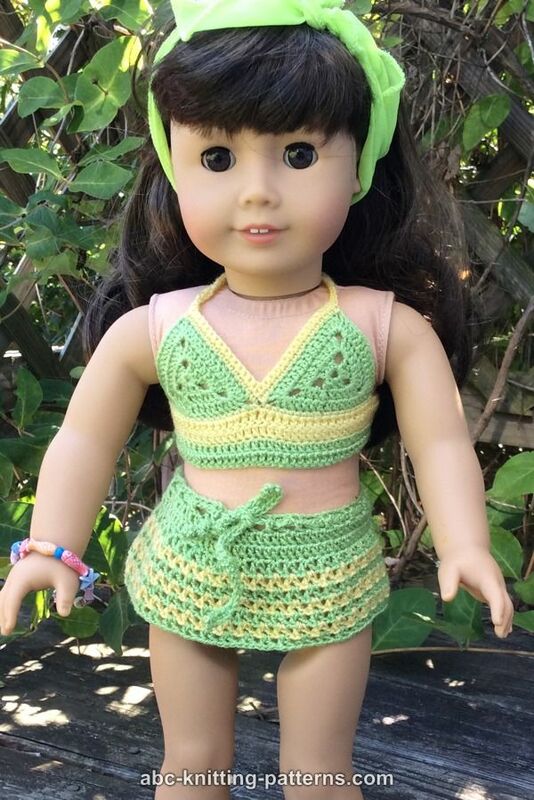 The entire swim suit should be a breeze to crochet. Great to combine with the AGD Beach Cover-Up! Note: Only small amount of thread is needed. Use left-overs. The bikini top is made of 2 triangular motifs crocheted separately, then connected together. With MC chain 4, join with slip stitch into a ring. Round 1: ch 3 (counts as 1 dc), 2 dc into ring, *ch 2, 3 dc into ring - repeat 2 times, ch 2, join with slip stitch in the top of 3ch. Round 2: ch 3 (counts as 1 dc), 1 dc in each of the next 2 dc, *(3 dc, ch 2, 3 dc) in chain-2-space, 1 dc in each of the next 3 dc -repeat 2 times, (3 dc, ch 2, 3 dc) in the last chain-2-space, join with sl st into top of ch3. Round 3: ch 3 (counts as 1 dc), 1 dc in each of the next 5 dc, *(3 dc, ch 2, 3 dc) in chain-2-space, 1 dc in each of the next 9 dc -repeat 2 times, (3 dc, ch 2, 3 dc) in the last chain-2-space, 1 dc in each of the last 3 dc, join with ss. With CC, chain 23, 17 sc along the lower edge of the first triangle (the first and the last sc go under the corner of chain-2-spaces), 17 sc along the lower edge of the second triangle, chain 23. Turn. Row 2: ch 3 (counts as 1 dc, insert hook in the 4th chain, 1 dc in each of 22 chains, and 1 dc in each of the 34 sc, 1 dc in each chain of 23 chains. Turn. Row 3: ch 3 (counts as 1 dc), 1 dc in each of the next 79 dc. Fasten thread, tie off, cut. With MC Rows 4-5: repeat row 3. Row 1: chain 50, 1 sc under the ch-2-space (upper corner of the first triangle), 1 sc in each of the next 15 sc, 1 sc in ch-2-space, continue along the side of the second triangle: 1 sc in ch-2-space, 15 sc, 1 sc in ch-2-space, chain 50. Turn. Row 2: ch 2, 1 sc in each chain (50 sc), 1 sc in each of the next 16 sc, skip 2 sc, 1 sc in each of the next 16 sc, 1 sc in each chain. Fasten, cut. Sew on small pieces of Velcro tape to the ends of top. With MC chain 80, join with slip stitch into a ring. Round 1 (belt or eyelet row): ch 4 (counts as 1 dc and ch 1), skip the next chain, *1 dc in the next chain, ch 1, skip the next chain - repeat to the end of the round. Round 4: ch 4 (counts as 1 dc and ch 1), dc in the same st, *skip the next dc, V-st in the next dc- rep to the end of the round, sl st.
Switch back to MC. Rounds 5, 7 and 9 use MC. Rounds 6 and 8 use CC. Rounds 5-9 like round 4. Tie and cut thread. 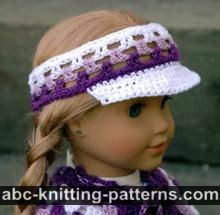 With CC ch 140, or to desired length. 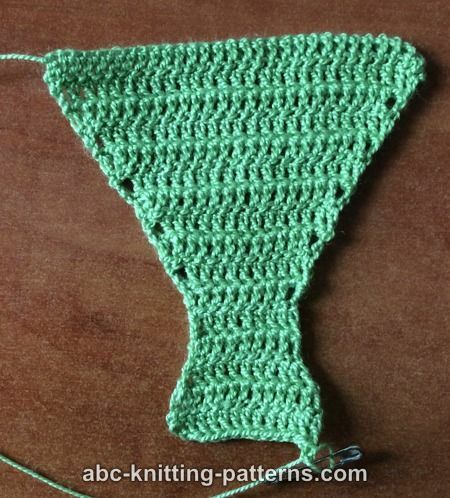 Turn and crochet 1 sc in each ch. Rows 3 though 11: as row 2, each row you decrease the number of stitches by 2. In row 11 you'll have 10 sts. Rows 14-16: ch 3, dc in the same st, 1 dc in each dc across, 2 dc in the last dc. 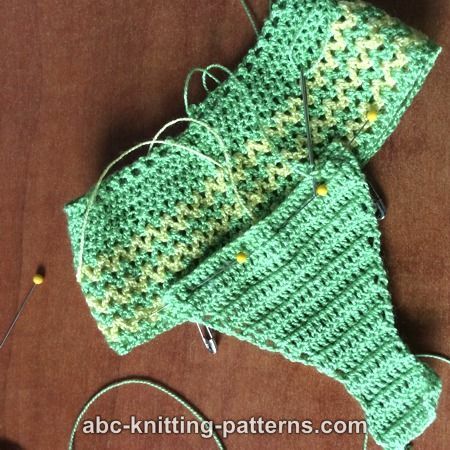 In this way the number of stitches increases by 2 in each row = 12 sts, 14 sts, 16 sts. Tie, cut off thread, leaving a 12" long tail. Count all V-sts, there should be 41. If the number is different, adjust accordingly to determine where to attach the crotch. Turn the work right side inside. From the center of the back (the beg of the rounds) count 5 V-sts to the left, place a marker and 5 V-sts to the right, place a marker. From each marker, count 13 V-stitches to the left and to the right and place 2 more markers on the front of the skirt. There will be 4 V-sts between the front markers. 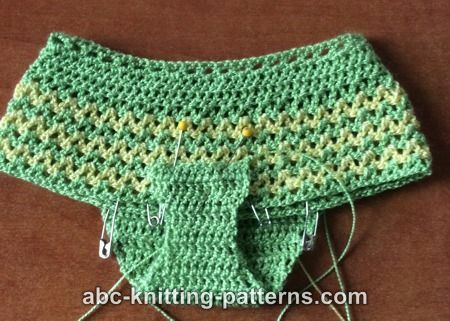 Position the wider edge of the crotch between the first 2 markers at the 4th row from the top (6th row from the hem). Pin in place. Thread the tail and sew the crotch edge to the skirt. 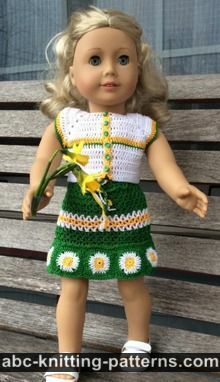 Now turn the narrow edge of the pants over the skirt and position it between the front markers at the 6th row from the top (4th row from the hem). Pin. Thread the tail and sew the edge to the skirt. Weave in all thread ends. Insert belt into the eyelet row. Why do I keep ending up with squares instead of triangles? 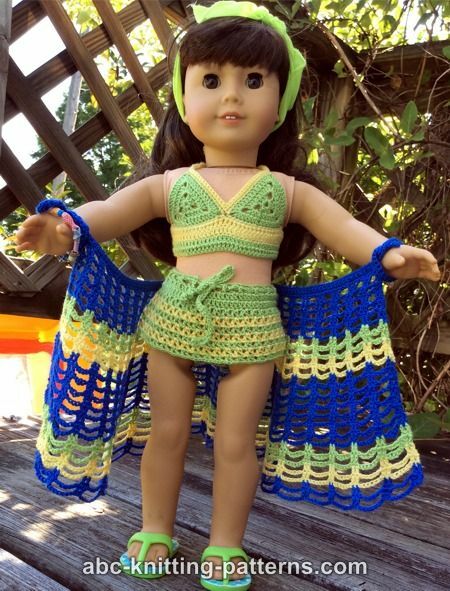 Can you make the swimsuit with regular 4 ply yarn or baby yarn, I cannot work with the thread and if you can what size hook would I use?